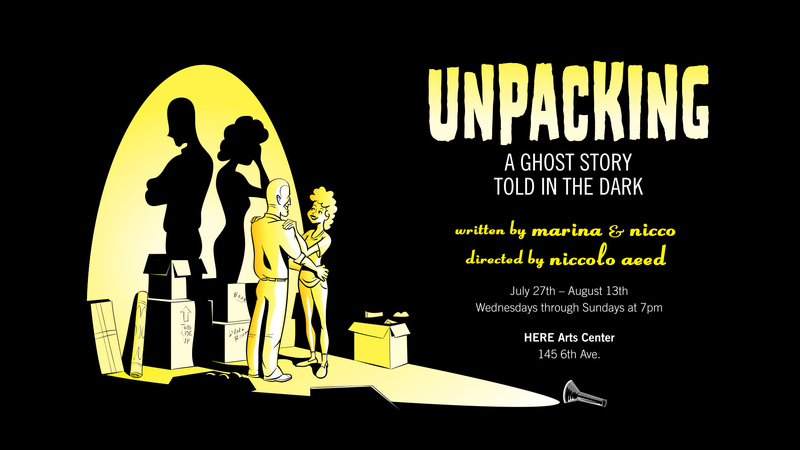 Comedy writing team Marina Tempelsman and Niccolo Aeed’s new show Unpacking: A Ghost Story Told in the Dark opens its run at HERE tonight at 7:00 PM. I was a huge fan of last year’s Room 4, which also featured Unpacking star Temesgen Tocruray, and I couldn’t wait to see what was next from this hilarious and insightful writing team. Before opening night, I sat down with Marina and Nicco to discuss the show’s novel lighting design, developing an on-stage romance, and what scares them off-stage in the real world. What is Unpacking: A Ghost Story Told in the Dark? 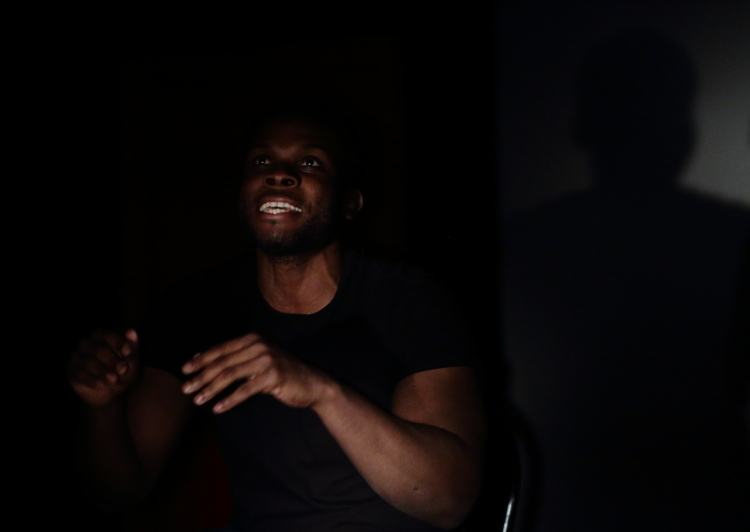 Nicco: Well, it’s a ghost story, told in the dark, and it’s told in the dark because the audience lights flashlights, very much like an “oooooh” type story. It’s a story about the ghosts who haunt us, which is I think almost every relationship I’ve ever previously had, and they come out more when you’re living with somebody, when you’re getting to know somebody and their ghosts. Marina: It’s like part comedy, part mystery, part drama, and it’s basically about a couple that moves in together, and basically the second they move in, they start seeing the ghosts of their past relationships all around the house during a blackout. And so they’re kind of simultaneously managing their ghosts and managing each other and this new dynamic in their relationship. When writing Unpacking, were you influenced by romantic comedy or horror genre creators like Nora Ephron or George Romero? N: There’s a Stephen King quote that I really like, which I’m now going to butcher. People who deny that there are ghosts are simply ignoring their own heart, or ignoring things inside of them. I mean, I like metaphors that are also kind of real. I think we all are constantly thinking about our past and why that’s scary. It’s probably less horror in its current form but more about emotions and relationships, but I think that’s the best type of horror, when we’re confronted with something personal, something we think we’ve forgotten or gotten rid of but actually cannot get rid of. M: Yeah, and I think in terms of tonally, a lot of the comedy comes from the inconvenience of moving, the devastation of seeing the ghosts of your ex and your ex-relationships but also the inconvenience of seeing the ghosts of your ex-relationships and how the ways in which that is troubling and tiresome and kind of pulls you back away from your future. N: I think there’s also something in seeing your partner’s ghosts when you’re already beseeched by your own ghosts, having to deal with someone else’s ghosts and if they are as important as yours, you know what I mean? It takes a lot to live with somebody or learn and grow with somebody. You have to kind of take all of their insane things while dealing with your own. M: You signed up to be in a relationship with one person and then you realize that one person comes with a whole flock of other mystery people that you need to reckon with. M: Yeah, and then so the task with that in mind, thinking that would be interesting, would be finding a framework and formatting that wouldn’t be a gimmick. Because, you know, you can just like turn off the lights on a play and give the audience flashlights and it will be like, “Okay, I guess.” So the goal is, what is a setting where it means something to have flashlights, and what is something that would be interesting for an audience to light by flashlights and uncover? Because what flashlights do is it gives the audience subjective power, right? Which is not normally something you really get to do while you’re watching a play, except for where to look, but there’s something kind of poignant about watching something that’s about people’s subjective ways of looking at the world while the light is being subjectively imposed by the audience members. N: I think there’s also something in that really puts you in a physical space. Part of the fun of flashlights is, is there something coming from behind me? Where will they emerge from? As people move into a new house, there’s a lot of exploring of the space that the audience does. M: It puts the audience in the same place as our characters are in because our characters are constantly like, oh no, what else is lying in my imagination? What else is around the next corner? Who else am I going to remember next? And our audience doesn’t want to miss something like this. Where’s the next person going to pop out of? In a funny way, in giving our audience some agency, it kind of parallels the characters’ agency or the choices they are making in the play as well. N: The last element, when we originally put it up at the PIT for a few shows, we could watch people watching the show too with the flashlights, which is fun. There is something voyeuristic. With the flashlight, you have your little window in, and so you can see people looking and peering in at this intimate moment, but you can also see the couples move a little further away or together. You can see what they’re focusing on, so it’s like this double peeking into lives. M: And it’s fun because everyone in the audience has a different approach to their flashlight. It’s interesting to see the people who are, “Alright, I see what’s going on. I want to know what’s going to pop out behind me,” and then there’s people who are trying to light it responsibly. 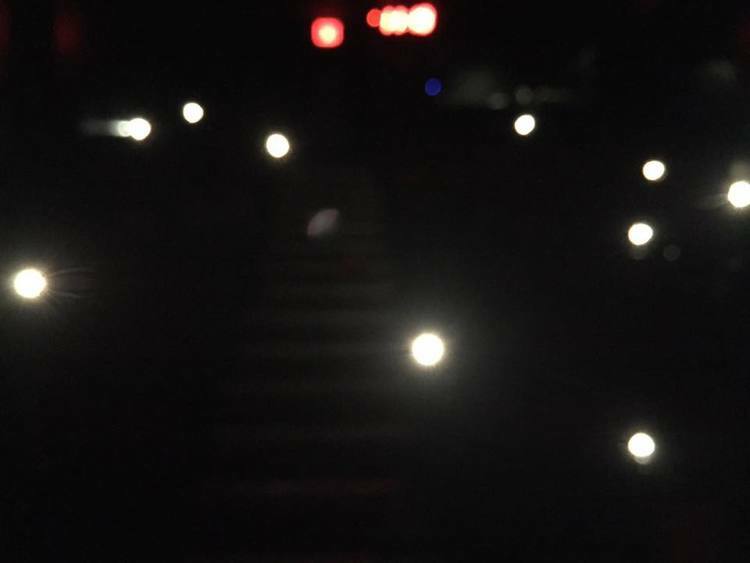 N: There’s often a collective group of flashlights hovering around and like a searching one. M: Yeah, it’s really cool. It’s really interesting to watch people watching. What has it been like working at HERE after previously staging Unpacking at the PIT? M: I mean, we love the PIT so much. It’s been an amazing place for us. I think what’s great about here is that we don’t have to worry about a show coming in five minutes after us, so it means that we’ve been able to have a lighting designer, Kaitlyn Cechetti, and we’ve been able to have a set designer, Ally Spier, working with us and really thinking about where the audience is oriented and other lighting tricks that are going to pop up over the course of the show. N: I think what’s great about the PIT is that it gives time and space to so many groups, but also it feels good to own a space. This space is going to tell this story for these weeks. That’s the biggest difference. Coming back to the show, after having the run at the PIT and returning to it, did you feel a desire to update it or make many changes to the script? N: I think a lot of our work often updates in the rehearsals as well as in the script. Having just done Room 4, I think a lot of the changes may be more in – rather than in the script itself – but like in the way we got the actors to put it together and creating it that way. M: The first time that we did Unpacking, we had a three week rehearsal process, so it was pretty compact. It was quick, and that was because it was part of our residency. We did a play a month, so you had a play and had to be writing another play and promoting the next play. Now that we have actually had months to get this thing together and take time with it, it’s really interesting to dig into the language a little more and finding the threads and relating to the different threads of it. N: Yeah, I feel like the characters have changed in their performances. I feel like we lived in it more, which feels good. M: And we have a couple of new performers too, and so that also obviously changes the dynamic in ways that are really exciting and interesting to see. With romances, especially romantic comedies where there is so much banter, it’s dependent on the chemistry. How did you find your leads, and how did you develop that relationship on-stage? N: The leads are people we’ve worked with, mostly actors we’ve worked with before in our sketches. 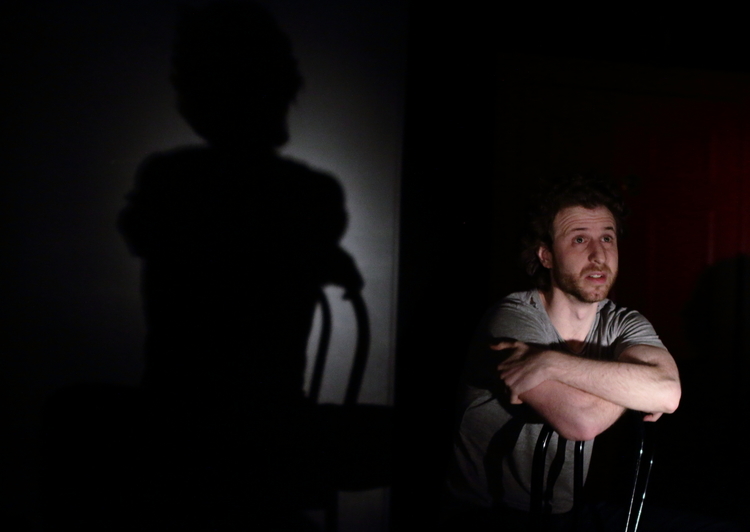 We first met Temesgen [Tocruray] doing this play a year ago through an audition process. He came back, and SJ Son is the other lead now, stepping in. Priya Patel was in the role previously. We’d worked with her and know her. She’s great. We like continuing to work with people and building our relationship. That’s part of it, and the other part is a lot of staring into each other’s eyes during rehearsal. A lot of forced bonding, seeing how people interact and play with each other. The nature of a relationship changes depending on the type of chemistry, so in early rehearsals, we were doing improv and finding the narrative, and we noticed that SJ is much more physical to Temesgen, like pushing him around in controlled spaces in a different way. Their love story is a different type of love story, even though it is the same character, and it felt similarly also with her ghosts too and her reactions to them. I don’t know. I feel like people bring their own thing and then it’s just about living with each other a bit to find that. M: Yeah, and I think we’ve also been lucky that we work with people who are very open-hearted as humans and as performers, so I think that they really adapted themselves to living in this story, listening to it, and channeling their own experiences into it in ways that are very gracious. I think that in addition to the work that we have done, there are some ways in which we’ve lucked out and gotten really good people to do really amazing work. Do you have any other upcoming projects that you’d like to plug? N: So, if you look up MarinaAndNicco.com or our Funny Or Die page, we’ve got videos coming out this year, and we’re creating a web series coming out. We’re filming the pilot of it this August. M: It’s for Brick TV, so that will be really fun. We’re doing a one-off show as well for the Ice Factory Festival. We’re going to be doing one night at their Fridays on Ice, where they’re having different comedians host an hour-and-change shows. So we’ve rewrote a bunch of monologues, sent them to a bunch to our writer friends to write scenes using those characters, and then we brought in a bunch of directors to direct those scenes. So it’s this big, sprawling, collaborative thing based loosely on strangers in a subway, and we are just as excited as the next person to see what it looks like because we’re a few degrees of separation away from it. The people who are working on it are really cool. N: And that is Friday, July 28 at 10:00 PM at the New Ohio Theatre. So last question, in 2017, what scares you the most? N: I feel like this is such a difficult – I mean, so many things scare me but in so many different ways! I feel like there is existential dread, but that’s not fun-scary, you know what I mean? The thing that actually, the most childishly scared I get is being in the suburbs. I feel like I’ve never felt particularly scared in New York or felt many ghosts in New York in the same what that I feel like open and vulnerable in darkness. I feel like there aren’t enough street lamps. I feel like there are less people and more alone-ness. In a childish way, being in the countryside or suburbs alone freaks me out. Trump is probably more likely to kill me. M: Oh man, I don’t know if I have a super-clear answer to this. I think maybe what scares me the most is – well, there are so many things that scare me. I’m a real baby. The thing that scares me the most is seeing people back into corners with no hope of ever communicating effectively with each other. I think that’s a thing that feels so – the idea that people are operating in totally different realities that have nothing to do with each other. I mean, I am scared of more concrete stuff, like that we can get wiped out any second, but it’s just interesting and terrifying to me that with all the same facts on the table, even if not all the same life experiences, that we can be so alien to other people and have no way of coming together in a human way. N: Yeah, that’s a good way of putting that. M: It’s like disappearing into our own little sinkholes of information, it’s the thing that really scares me. M: And also airplanes, and peanuts because I’m allergic to them. N: Oh yeah, that’ll kill you. Unpacking: A Ghost Story Told in the Dark runs July 26 thru August 13 at HERE, 145 Sixth Avenue. Tickets are $25 and are available online, at the box office, and by phone at 212-352-3101. HERE also offers free student rush tickets for elementary, high school, and college students with student ID, at the box office before the show begins and subject to availability.